Boxelder bugs are another of Nature’s creations that cause us to scratch our heads and softly mutter under our collective breaths a puzzled “huh”--as in, what good are these little rascals? But, whereas the fireflies redeem themselves by adding aesthetic and poetic ambiance to summer evenings with their amazing visual “on-and-off” display, the boxelder bugs have no redeeming social value. In fact, just the opposite is the case--their presence is an annoyance. They gather in clusters on the outside of houses, and make a nuisance of themselves by coming indoors around windows, garage doors, patio doors, and other entrance ways. They are especially plentiful on the sunny southern exposures of buildings late in the summer and into early fall as the temperatures cool and the boxelder bugs seek shelter indoors from the oncoming colder weather. And while they don’t bite, their presence is an irritation to the human inhabitants of such dwellings, and they do discolor window sills and other surface areas with their excretions. 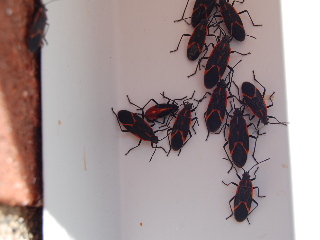 On the brighter side, boxelder bugs are relatively easy to identify from their dark brown or black coloring, with “highlight trim” coloration of reddish orange. That’s about the only good thing we can say about them! Sorry, fellas. If you have boxelder bugs around your home, they are probably there because you have boxelder trees (Acer negundo) nearby. The bugs feed on the seed pods of the female boxelder trees. They are sometimes also drawn to other members of the Acer genus (the maples). And, although it might seem to be a rather drastic means of pest control, removal of the food bearing boxelder trees can be a method of eliminating the boxelder bug varmints from your homestead. If you don’t want to get in to removing the host trees (maybe they provide desirable shade or you just like their looks), you can focus your efforts more on combating the little bugs head-on. One method of chemical control useful in eradicating boxelder bugs is to spray around entrance ways (the aforementioned doors and windows) with a mild pesticide. I’ve found Ortho(R) Home Defense Max Pest Control spray to be effective in sending the little offenders to their final resting place in bug heaven. Properly applied around your household windows and doors, the spray not only kills the bugs you see, but it also has a long-lasting residual effect that kills the bugs that happen to arrive later on at your premises and have not done their homework in investigating into which homes in the neighborhood are hostile (toxic!) to the little invaders!